Pro Football Focus (@PFF) always does an excellent job with all things NFL related. 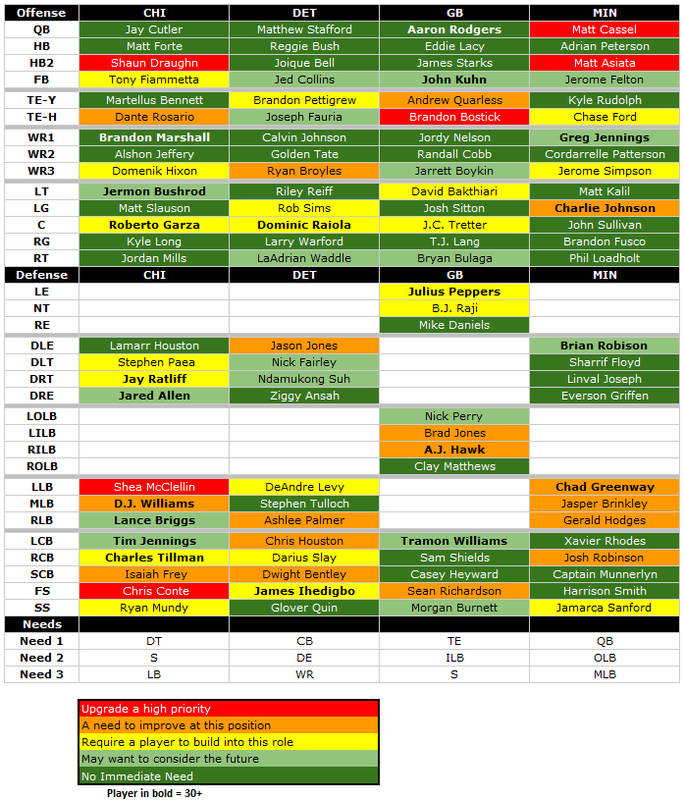 One of their great tools for use during this year's NFL Draft was the offensive and defensive starting 22 for all teams color coded with the replacement/upgrade need at every position. It's broken down by division. I'll lead off with the NFC North and then the rest of the NFC before the four division in the AFC. Enjoy. Best way to sum up the 1st Round: Pittsburgh made a Steelers pick; Baltimore made a Ravens pick; Detroit made a Lions pick. Nothing changes. Like clockwork the Lions disappointed their fans again by ignoring many needs and taking another "offensive weapon" in the first round. Eric Ebron is the best tight end in this draft - by far - but that doesn't mean he's a good draft pick. If the Lions had an average back seven and needed offensive help then the pick isn't terrible. (Some would argue, and I'm one of those people, that taking a tight end in the Top 10 and even the first round doesn't make sense). He has good measurables (6-foot-4, 245 pounds) but he's not what Detroit needs. The newest "offensive weapon" for the Detroit Lions - TE Eric Ebron. For the second-straight year (and ninth time in 14 seasons) the Lions have a Top 10 pick in the NFL Draft. You would think a team with the practice of picking high in the draft would get it right, wouldn't you? Of course, it could be argued there is a reason the Lions pick early in most years. It's why I think the team takes a big leap this season as long as the draft yields some of those necessary pieces. 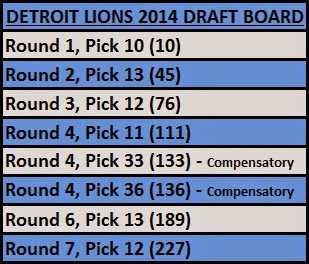 There is your basic Lions draft board with no original fourth rounder but added compensatory picks at the end of the fourth and seventh rounds, respectively. beginning of his rise to the No. 1 pick in the NFL Draft. Believe it or not the excitement towards this year's NFL Draft doesn't quite seem to be at the fever pitch of previous years. The only explanation - this is the NFL of course - is the draft being pushed back a few weeks into May. The delay gives teams a little more (necessary?) 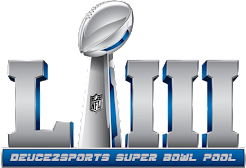 time to vet potential draft picks and to study film but it unfortunately has draft talk shoved down NFL fans' throats for an additional two weeks. At some point even the NFL can be ad nauseam, right? This all being said, Thursday will still be another banner day in the NFL. Ratings will soar and there will be no less intrigue than in previous NFL Drafts. The only certainty - and it's very debatable calling this a certainty - is that Jadeveon Clowney will be the No. 1 overall pick. (That seems to be true whether Houston keeps the selection or if another team such as Atlanta trades up). Other near certainties are Sammy Watkins being the No. 1 WR off the board and Khalil Mack being the first linebacker picked. Other than those listed above everything is a complete crap shoot. Here's my final mock draft, derived from talking with people in the know and gathering information to the best of my knowledge. Chances are, like everyone else making mock drafts, I was breathing too much smoke. No RBs, again? Last year was the first since 1963 that no running backs were picked in the first round. 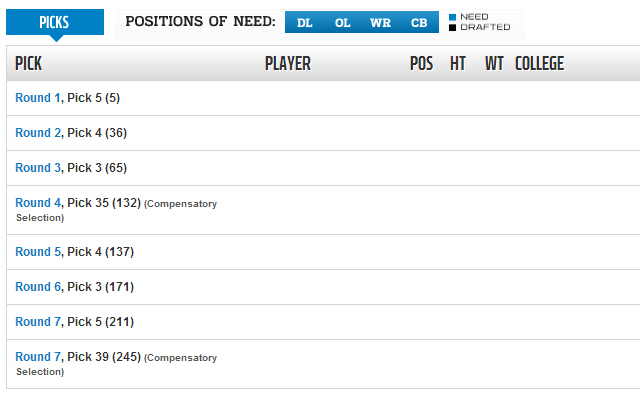 (Giovani Bernard was the first RB picked, coming off the board at No. 37 to the Cincinnati Bengals). Big Ten gets back in Round 1: 2013 was the first year since 1953 that no Big Ten players were selected in Round 1. 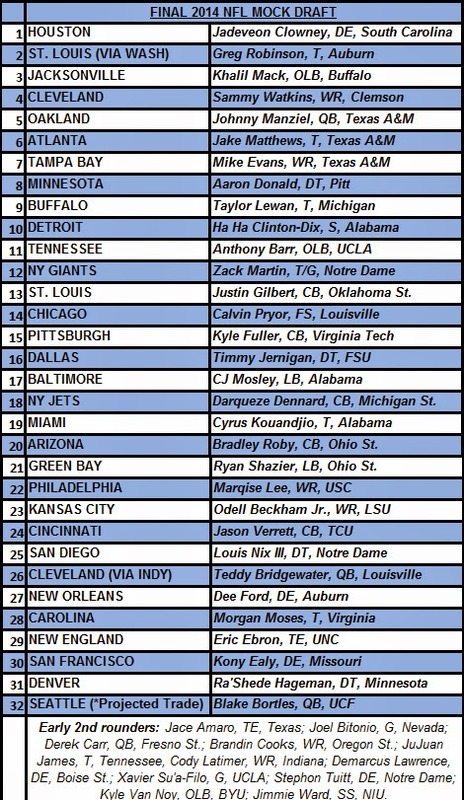 It seems a lock that Michigan's Taylor Lewan and Michigan State's Darqueze Dennard will go in the first round this year (as well as Ohio State's Bradley Roby and Ryan Shazier). Even Minnesota's Ra'Shede Hageman has been in many first round mocks as he is here.